SightRun mobile running application – good news for runners! Can you combine running and sightseeing? Of course you can! The SightRun mobile app for tourist running does just that! The creators of the app decided to offer runners the opportunity of not sacrificing their routine when visiting a new city. Thanks to this app runners who are visiting Zagreb can get to know the city while they are enjoying their favourite activity. The app contains audio running tours which combine running with sightseeing. All that you need to do is download onto your smartphone your chosen tour, put on your earphones and press play. SightRun not only helps runners to get to know new destinations but presents the destinations as “Runner Friendly”. Apart from the fact that tourist running is a new tourist offering, SightRun is also a chance for local runners to get to know their city in a completely new way. Running tours from the SightRun mobile application are available in Croatian and English. 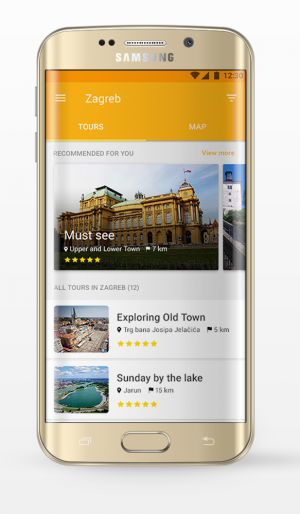 The first city on offer is Zagreb – a runner-friendly city and a destination for runners, after which the app will be available for other Croatian cities.